“Aim for the moon. If you miss, you may hit a star.” A famous quote by self-help business guru W. Clement Stone. It says a lot about why targets are important to every company and individual – and why it’s important to push yourself to aim high. 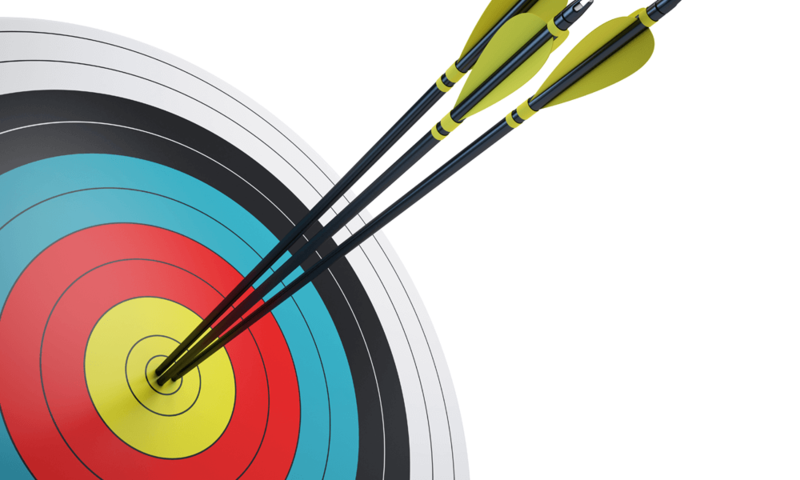 In business terms, a target is a goal that the company is aiming to reach. But targets don’t just tell us what we are aiming for – they let us measure the distance by which we fall short, and the amount of work we need to do to make it up. The more specifically defined your target is, the clearer you will be about what you are trying to achieve, to everyone involved. For example, “To increase sales by 5% over the next 12 months” would be a far better target than “To increase sales”. Being as specific as possible sets a very clear picture of what you are aiming for and focuses attention on hitting goals. Would “Increase sales by as much as possible” not be a better target? No! That implies that maximum sales must be achieved at all costs – regardless of the detrimental effect it could have on other targets, e.g. customer service or quality related targets. Setting a specific target (which must also be realistic – see my next point) removes ambiguity and means everyone knows what they are trying to achieve when they get to work in the morning. Setting unrealistic targets is a recipe for disaster. You, and anyone working with or for you, know what your capacity is, and what is or isn’t achievable. Your targets should always be stretching, and challenging – but not so far that they seem hopeless, as that will just be demoralising. Being realistic means taking into account what is and isn’t possible. You can look to your competitors or industry benchmarks for guidance, but always be aware of your own capacity. That isn’t to say that capacity can’t be increased – in fact hitting a vital target could be a very good reason to increase capacity, by investing in more workers and equipment or by improving the way things are done. But setting targets which can’t (or are highly unlikely to) be achieved at current capacity and without willingness for extra investment in capacity will lead to failure. The balancing act required here, in order to meet the lofty expectations set out by W. Clement Stone, while remaining realistic, is a big part of what makes a good target-setter! Targets can be outcome-based (i.e. sales/profits) or operational – such as ensuring the quality of your products during manufacture. If your top-level targets are not supported throughout the delivery process, you will be unlikely to achieve them. To set, and meet a challenging top-level target such as increasing company profits, other targets must be met, right across the delivery chain, from customer satisfaction to product quality to staff engagement. Any inefficiencies in the system will drag down the top-level results, making it harder to hit your target. Also, setting targets for top level outcomes without monitoring the achievement of lower level targets can cause frustration. Make targets fun! In short, the idea is to take cues from the compulsive behaviour often elicited from people through games, particularly video games. Point scoring, bonus goals and a structured reward system all act as psychological “hooks” which persuade people to engage.